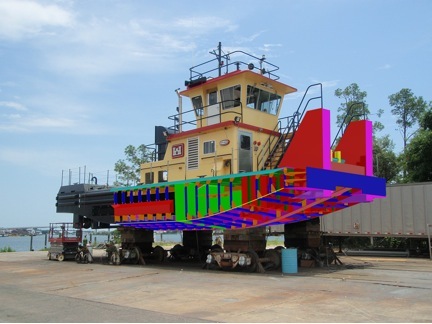 (Seattle, Wash., August 17, 2010)—The Jensen Maritime-designed river push boat, the M/V Stephenson II, has been successfully delivered to the U.S. Army Corps of Engineers for use in Gascondale, MO, in the Corps’ Kansas City district. Jensen performed the functional design and production lofting of the ABS Classed, 58-foot, 770-horsepower boat, which will provide operational support for the district’s operations and maintenance mission on the lower Missouri River as well as for general construction and mitigation projects. Patti Marine Enterprises, Inc., (PME) of Pensacola, Fla., which built the vessel, hired Jensen to take the Corps’ design for a smaller and narrower boat and create the functional design and production lofting. Lofting essentially involves taking a vessel design and creating a building kit for the shipyard, including assembly drawings and directions for the cutting machines. This process helps optimize building productivity and quality. Jensen worked closely with PME to ensure the vessel was successfully delivered on time. As a day boat and support vessel, the M/V Stephenson II has no accommodations and no provisions for fresh water, although it does come equipped with an Incolet brand of head as a small crew comfort. Noise and vibration reduction of the exhaust system was very important to the Army Corps, which wanted no more than 20 percent transmissibility. Jensen designed the system to use cable-mounted silencer isolators and pipe hangars, which greatly reduced the amount of noise and vibration transferred to the crew areas. Seattle-based Jensen Maritime Consultants, Inc., is a Naval Architecture & Marine Engineering firm owned by Crowley Maritime Corporation. The company offers a diverse range of consulting, design and engineering services developed from nearly 50 years experience working around the world. Jensen is a recognized leader in the design of all types of vessels–particularly work boats, fishing boats and passenger ferries–and has built a favorable reputation on a long history of successful designs and conversions with close attention to engineering basics. Jensen’s international on-site consulting services provide on-location assistance anywhere in the world.